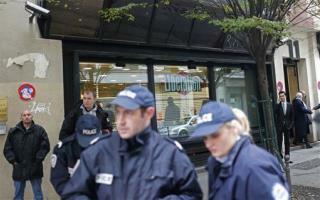 (Newser) – A manhunt is under way in Paris for a man believed to have opened fire at a newspaper office and a bank branch before hijacking a car. A man with a shaved head burst into the offices of left-wing newspaper Liberation this morning and opened fire, hitting a photographer's assistant in the chest before fleeing, Reuters reports. The same man is believed to have opened fire again outside a suburban Societe Generale bank about 90 minutes later, according to police. No one was harmed in that shooting; the photographer hit in the first is "fighting for his life," according to the BBC. Shaved head? You mean to say Skinhead. Europe's Radical Right has been getting bolder & more violent. So the guy hijacks a car, drives to the Champs Elysse and gets out and "fades" into the crowd? Silly question, but I would think it a bit odd seeing a guy on the Champs Elysee with a shotgun, so how does he fit in with the crowd? Next time, I will not miss you? Sheesh. Even when taking the crazy train the French have to be so dramatic and lackadaisical.